I'm very excited that today is my first day for hosting Cookbook Sundays (keep reading for more details), so something a little bit indulgent and celebratory to share with you seemed to be in order. This sweet treat makes the perfect ending to a meal with a coffee or a "sticky", or a lovely handmade festive gift for a special friend. 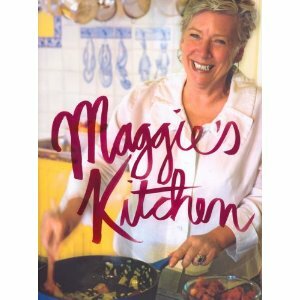 This recipe comes from "Maggie's Kitchen" by Maggie Beer, but I do confess to having made a bit of a departure from the original recipe which called for the inclusion of prunes soaked in sherry. You might have seen this post back in February when I made, amongst other things, Damson Gin. Well, a couple of weeks ago I decided that said Damson Gin would be ready for drinking. I strained the liquor off into a bottle, but was then left with the gin-soaked damsons themselves. After sampling a couple of them, I decided that they were far too good to discard. So they've been sitting in a jar in my fridge waiting for some inspiration, and as soon as I stumbled on this recipe I knew I'd found just the right thing. The damsons, after sitting in alcohol for 10 months impart an almond flavour and fragrance, which I thought would complement nicely the almonds in the slab. It did occur to me however that I could be setting you all up for cyanide poisoning, but after eating quite a lot of the gin-soaked damsons this afternoon I can tell you that I have come to absolutely no harm - did get a bit tipsy though - just saying! And, of course, it was purely in the interests of public safety - such are the lengths I will go to in order to ensure your well-being. This was a doddle to make, even in a slightly inebriated state, with the hardest part being waiting the hour for the chocolate to set. Now, I know not everyone has boozy damsons hanging around the place, so I will give you the directions for the prunes as well. Pre-heat your oven to 200 degrees C (400 degrees F). Spread the almonds in a single layer on a baking tray and roast in the pre-heated oven until they are golden brown - approximately 10 minutes. Remove from the oven, cool and then chop roughly. 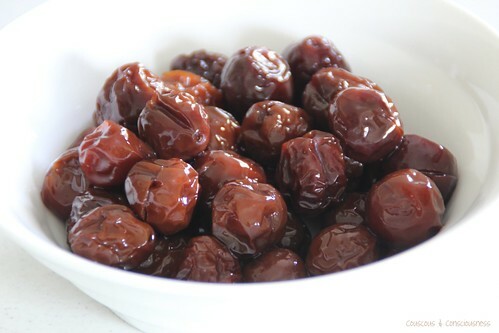 Note: If using prunes, soak them in the sherry until they have soaked up all the liquid, then chop roughly. Chop the chocolate roughly, and put into a heatproof bowl with the cream and butter. Set the bowl over a gently simmering pan of water, stirring occasionally, until melted and glossy. 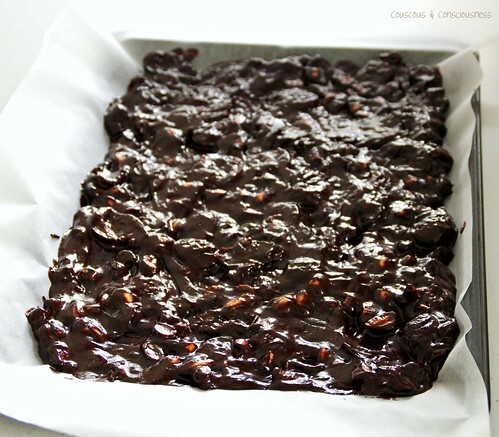 Add the damsons (or prunes) and almonds to the melted chocolate mixture, and stir to combine. Pour the mixture onto a baking tray lined with non-stick baking paper. Spread evenly into a slab, and refrigerate until set - about 1 hour. 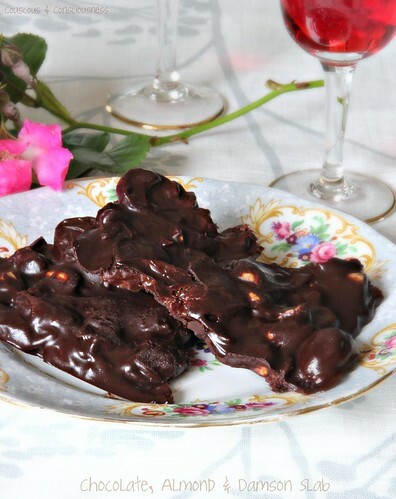 Once set, break into pieces and serve with coffee or dessert wine. I served mine with damson gin - what else?! Store in a cool, dark place (not the refrigerator) in a sealed, airtight container. 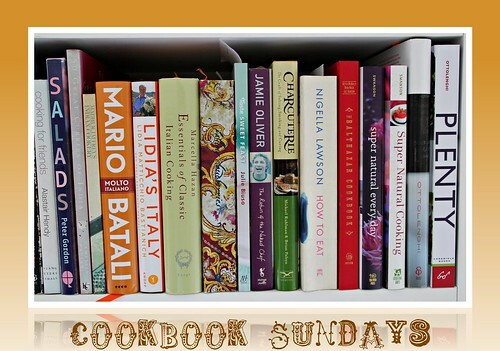 Now, at the start of this post I mentioned Cookbook Sundays. What is that all about, you are perhaps wondering. Well, if you're anything like me you have dozens of cookbooks gathering dust on your bookshelves, some of which have never even been cooked from. Sure I spent hours browsing through them when I first bought them, marking all the recipes I was going to make with little post-it notes, and yet still those books languish in the bookcase and never make it to the kitchen. There are others from which I have made but one recipe which was such a resounding success that I've made it over and over again, and yet somehow I've never made anything else from that book. Sound a bit familiar?! 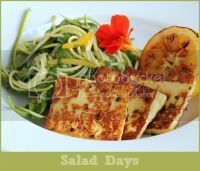 The rules for joining in are simple: your post must state the author and the title of the book your recipe has come from, and your post must mention Cookbook Sundays and link back to this post. That's it really. Including the Cookbook Sundays badge is optional, but always appreciated. You may submit as many entries as you like, and you may use the same cookbook as many times as you like. And remember, what goes around, comes around - one of the reasons you are participating in this is because you want people to read your posts, so do the right thing and go and visit a few of the other participants. I am also sharing this post with Sweet New Zealand, a monthly blog event created by the very lovely Alessandra Zecchini, and which this month is hosted by the equally lovely and incredibly talented Bron Marshall. 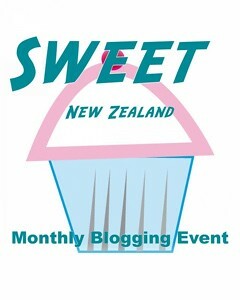 This is an opportunity for all Kiwi bloggers (whether you are living in New Zealand or overseas), as well as for non-Kiwi bloggers living in New Zealand, to connect and share some of those sweet treats from your kitchen. So, head on over to Bron's and share something sweet. Ok you win - I'm making this - or a variant of it - this weekend. Great idea to check out some of the cookbooks I never use! I won't be able to add anything this week but will try and join in regularly - I'm really pleased this event is continuing. Lovely idea for an event and the slice sounds delicious - I have just had fruit soaking for christmas pudding and it is a shame just to use such lovely soaked dried fruit once a year - plus I love prunes (never tasted damsons) and chocolate! I linked a recipe from Baked. Wonderful! I have never heard of damsons before. Looks like the perfect festive treat. Ahh...I feel so bad! Totally forgot that it's the first Sunday, and you're starting from #1. Will have to mark my calendar for each first Sunday's Cookbook. 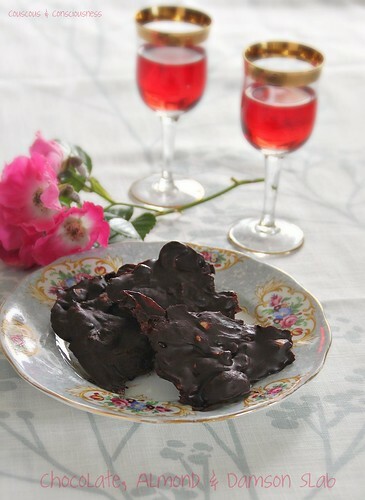 Love the chocolate bark, and those Damson's look so plump and totally amazingly yummy! I would participate for this Sunday, but my recipe is not from a cookbook! Ooh i am drooling at all this lovely eye food. Sue - I totally forgot about the Cookbook Sunday series. I will be sure to participate. To the best of y knowledge we don’t have damsons available here but we sure have prunes. This looks decadently delicious. Next summer i totally need to remember to stock up on Damson plums and get them soaking! This bark sounds delicious! And YES I'd LOVE to take part in Cookbook sundays! I try to make it a goal to cook a recipe or two from one of my cookbooks every week! Your choc, almond and damson slab looks wonderful! I can imagine how delicious they must be with prunes too! I've just linked up a cake, recipe from my latest collection of recipe books! One post-it less now! @Pierce Hi Tina - don't think that damsons are something you will generally find readily available commercially - more the kind of thing you would forage or know someone who has a tree. But in the absence of damsons, I have no doubt that this would be just as good with prunes. @Joanne I got my damsons this year from friends, who have a friend with a tree - hope they remember me again in February when damson season comes around again. The chocolate almond damson slab looks mouthwateringly good. How in the world did the plums survive the earthquake aftermath? We have our own little tree this year, already fruiting, but will need to go to our old source for quantity. You will definitely get some. Thanks for the inspiration! I've added my post. That chocolate damson slab sounds AMAZING! Sue, you are welcomed to our orchard anytime in Summer, for I always give away Damsons. My mum-in-law usually soak Damsons in gin and by Christmas time, the flavour is there. I've never tried for I don't drink, but it seems everybody who does try and drink it nod in agreement that the flavour is awesome. I'll pass your recipe to her, so she won't waste the damsons. XO. Arfi. @arfi binsted Thanks Arfi. If I am up Auckland way again over summer, I will definitely come for some damsons. I am lucky to have a good friend down here who supplies me though, so I definitely foresee more damson gin in my future. Hope your mother-in-law enjoys this recipe.